Photo 01: It has been noted that three camouflage schemes were applied to the He-219. Having established that the overall black finish applied when the Nachtjagd was first created was unsuitable as a night camouflage, and having developed alternative and more effective schemes, it seems strange that in the last months of the war the use of black was revived for use on the undersurfaces and the outer surfaces of the twin fins and rudders of some He-219s. A possible explanation may be that the RAF's offensive caused such giant conflagrations in German cities that the light from the fires may have illuminated the night fighters' 76 undersurfaces to an unacceptable degree. As seen on this machine, however, where black was applied, uppersurfaces were usually finished in 75 and 76. Photo 01: This He-219 A-2 found at Hildesheim, almost certainly WNr. 290112, shows again the black finish on the undersurfaces. It would be tempting to associate the application of the black with the night strafing of Allied motor transport and other targets of opportunity, a task assigned to the Nachtjagd during the battle for Normandy in the summer of 1944 and which continued through to the battle of the Ardennes. Neither this, however, nor the suggestion put forward (Heinkel He-219A NJG 01), explains why such a finish appeared only on the He-219 and, later, the very few two-seat Me 262 night fighters to see operational service. In any event, the black scheme on these aircraft was a permanent, factory-applied finish, and it seems improbable that the industry would apply a scheme for use on aircraft where night ground-attack was only a temporary role. Due to political rivalries between Josef Kammhuber, commander of the German night fighter forces, Ernst Heinkel, the constructor, and Erhard Milch, responsible for aircraft construction in the Reichsluftfahrtministerium (RLM — the German Aviation Ministry), the development and production of the aircraft was tortuous. The aircraft was also complicated and expensive to construct, a factor that further limited the number of aircraft produced. When Robert Lusser returned to Heinkel from Messerschmitt, he began work on a new high-speed bomber project called P.1055. This was an advanced design with a pressurized cockpit, twin ejection seats (the first to be planned for use in any combat aircraft), tricycle landing gear featuring a nosegear that rotated its main strut through 90º during retraction, to fit flat within the forward fuselage, and remotely-controlled defensive gun turrets similar to those used by the Messerschmitt Me 210. Power was to be provided by two DB 610 "coupled" engines producing (2,200 kW/2,950 hp) each, delivering excellent performance with a top speed of approximately 750 km/h (470 mph) and a 4,000 km (2,500 mi) range with a 2,000 kg (4,410 lb) bomb load. Construction of the prototype started in February but suffered a serious setback in March, when Daimler said that the DB 603G would not be ready in time. Instead, they would deliver a 603A with a new gear ratio to the props, with the new designation 603C. Even these took until August to arrive, and the prototype did not fly until 6 November 1942. When Kammhuber saw the prototype on the 19th, he was so impressed he immediately ordered it into production over Milch's objections. Milch — who had rejected the He 219 in January — was enraged. The He 219 had an auspicious combat debut. On the night of 11–12 June 1943, Werner Streib flew the V9 and shot down five bombers between 01:05 and 02:22 hours, before crashing on landing. A claim consistently made is that, "In the next 10 days the three Heinkel He 219A-0 pre-production aircraft would shoot down a total of 20 RAF aircraft, including six of the previously "untouchable" de Havilland Mosquito fighter-bombers. Greatly encouraged, Kammhuber continued to press for immediate production." No record of corresponding Mosquito losses or any documentary evidence exists, however, to suggest that He 219 pilots actually made claims for six Mosquitos during this time. Production finally got underway with the He 219 A-2 model which included a longer engine nacelle containing an extra fuel tank and typically included the Rüstsatz R1 kit with two 30 mm (1.18 in) MK 108 cannons installed as an offensive Schräge Musik upward-firing system, installed completely within the fuselage. 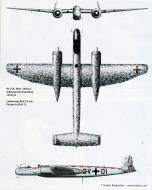 Production problems due to Allied bombing in March meant the A-2/R1 did not reach Luftwaffe units until October 1943. The first 10-15 aircraft were delivered with the 490 MHz UHF-band FuG 212 Lichtenstein C-1 radar sets, complete with their 32-dipole element Matratze antenna array. The He 219 was a capable fighter aircraft, allowing the pilots a large degree of autonomy. Ground control simply got them into the right area and then the pilots took over and hunted down the bombers on their own; the SN-2 radar's 4 km (3 mi) range was greater than the distance between the bombers. While the performance of the A-5 was not extraordinary — approximately 580 km/h (360 mph) speed — it was enough of an advance over the Messerschmitt Bf 110s and Junkers Ju 88Gs to allow the aircraft to chase several bombers in one sortie. The last major production version was the A-7 with improved DB603E engines. The A-7 could be outfitted with two 30 mm (1.18 in) MK 108s in the wing roots, two 30 mm (1.18 in) MK 103 cannons and two 20 mm MG 151/20 cannons in a ventral tray and two 30 mm (1.18 in) MK 108s in a Schräge Musik installation mid-way down the fuselage, fully contained within it. The relatively long-barreled MK 103s, however were not usually fitted due to weight considerations. A more reasonable project was the Hütter Hü 211, a design created by Wolfgang Hütter, that took a standard He 219 fuselage and tail and added a long-span, high aspect ratio wing of 24.55 m (80.54 ft) to create a fast, high-altitude interceptor. Since this design was to be powered by the Jumo 222, it was fated to never fly, although work continued on two sets of wings until they were destroyed by Allied bombing. Proposed reconnaissance-bomber aircraft. The project was abandoned. Two-seat night fighter version, armed with two 30 mm (1.18 in) MK 108 cannons in a ventral tray, two 20 mm MG 151/20 cannons in the wing roots, plus 30 mm (1.18 in) two MK 108s just behind the cockpit. An unbuilt multi-role aircraft project entirely unrelated to the He 219, only having the number sequence in common. Various derived projects culminating in He 419B-1/R1, six of which were flown; use of the He 319 tail, very long-span wing of 59 square metres (635 sq ft), two 20 mm MG 151/20 in the wings and four 30 mm MK 108 in ventral housing. Speed of 422 mph (679 km/h to 44,619 ft (13600 m)) .